"Bodybuilding Spinach Benefits and Why Gobbling Your Greens Keeps You Strong!" 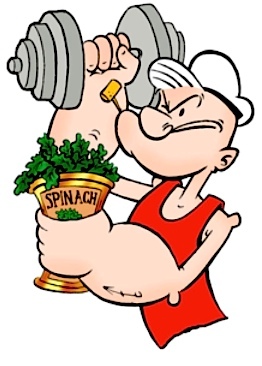 Discover how spinach benefits your bodybuilding and keeps you strong to the finish like Popeye. It looks like Popeye was right all along. Gobbling up your greens really can keep you strong! Researchers monitored the lifestyles of hundreds of over-65s and discovered that those on a healthy diet were more muscular due to their intake of fruits and veggies. Men, in particular, remained strong and toned when they ate more than the UK government's recommended five portions a day of greens like spinach, cabbage and broccoli, along with fruits such as apples, bananas and pears. The findings from Ajou University in South Korea, were published in the journal Age and Aging and suggested simple foods could win the war against age-related muscle loss. Paul Green, of the over-50s lifestyle company Saga, had this to say: "People at this stage of life invariably don't like to have too much on their plate, but when it comes to fruit and vegetables - the more the better." This exciting research comes hot on the heels of results released from the University College of London that showed "5 a day portions are no longer enough." They wrote: "Is it perhaps time to update the 'five-a-day' message to '10 a day'?" And when you weight train, suddenly a diet rich in fruits and veggies becomes vitally important to you. But our spinach story doesn't stop there. In addition to keeping you strong, spinach also provides you with energy. Yet the power of spinach won't be found in iron as commonly believed. Instead, you will find it in the nitrates in green, leafy vegetables. The (nitric oxide) chemical has been shown to boost units within cells to provide energy, a study has shown. Professor Eddie Weitzberg, from the Karolinska Institute in Sweden, said: "We know that diets rich in fruits and vegetables can help prevent cardiovascular disease and diabetes, but the active nutrients haven't been clear. This shows inorganic nitrate as a candidate to explain those benefits." So it looks like Popeye was right all along. Gobbling up your greens really does keep you strong!